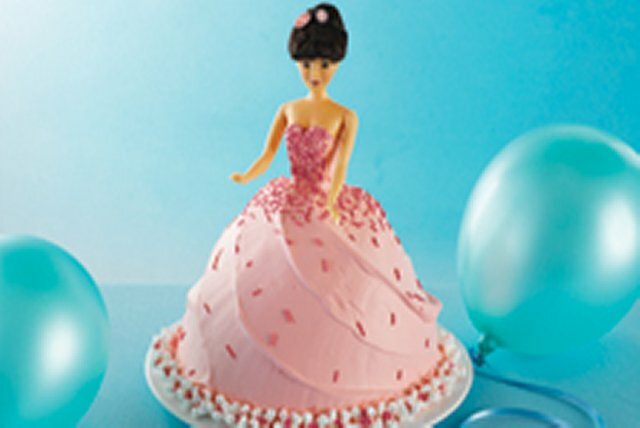 Celebrate her birthday with a Princess Cake! No need to visit a bakery when you could make a Princess Cake at home with just 30 minutes of prep time. Stir boiling water into dry gelatine until completely dissolved; set aside. Beat cream cheese in large bowl with electric mixer on medium speed until creamy. Gradually add gelatine mixture, beating on low speed until well blended. Add sugar and vanilla; beat 2 min. Gently stir in 1-1/2 cups of the whipped topping. Spoon one third of the cream cheese mixture into plastic wrap-lined 1-1/2-qt. bowl. Stand one half of the ladyfingers, cut-sides in, around side of bowl. Spoon remaining cream cheese mixture into bowl. Arrange remaining ladyfingers, cut-sides down, evenly over cream cheese mixture. Unmold onto serving plate; remove and discard plastic wrap. Insert doll pick in top of cake. Tint remaining whipped topping with food coloring; spread over gelatine mold to resemble doll's dress. Decorate with sprinkles and assorted candies. A doll pick can be purchased at craft or specialty cake stores. This is a fun cake to prepare with your child and share with a crowd.